Today I’m delighted to welcome fantasy and science fiction author Fran Wilde! Her debut novel, Updraft, won the Andre Norton Award, received the Compton Crook Award, and was a finalist for the Nebula Award for Best Novel. It’s followed by the second book in the Bone Universe trilogy, Cloudbound, with the third book, Horizon, following in September 2017. 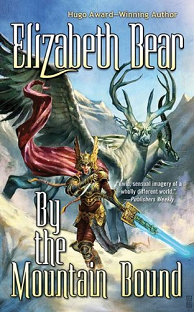 She’s also the author of several short stories and the novelette “The Jewel and Her Lapidary,” a finalist for both this year’s Hugo Award and Nebula Award! I remember the first time a beloved series (Le Guin’s Earthsea Trilogy) shifted narrative-focus characters on me between books. It was a bit wrenching. I was grumbly for hours. WHERE DID GED GO aughhh @[email protected]!%$%(#. And then I got into the story. Tenar was different, but as excellent a guide for Tombs of Atuan as Ged had been for Wizard of Earthsea. Better even. Because Ged was there too, and back again in The Farthest Shore, but now I’d gained a wider view of both him, of Tenar, and the world around them. When I set out to write Updraft, the first book in the Bone Universe series, I knew the story could be told from either Kirit’s or Nat’s perspective. I’d heard Kirit’s voice initially and loudly; I had to tell her story first. But when it came to writing Cloudbound, which is about learning to lead in the face of adversity, I knew the voice needed to be Nat’s. Even as I made the shift, I remembered reading Tombs of Atuan and missing my favorite, but the story—and the world—required a broadened perspective. In Horizon, the third and final Bone Universe book out this September from Tor, I’m using perspective shifts again, including two voices already familiar to my readers. Why do this? In secondary world science fiction and fantasy, where a limited point of view can narrow focus (often with excellent results), a shift in perspective can also expand the story. The choice is both a difficult one for an author and an opportunity, one numerous authors in both adult and YA series engage. In N.K. 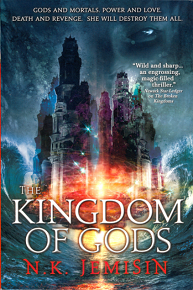 Jemisin’s Inheritance Trilogy, Yeine Darr narrates The Hundred Thousand Kingdoms, Oree Shah takes The Broken Kingdoms, and Sieh—the child god—speaks The Kingdom of Gods. I asked Jemisin what some of the considerations for shifting the point of view character between books in the Inheritance Trilogy were and whether the worldview changed. This is awkward to answer, simply because it implies that the story could have been told in any other way. But the trilogy was the story of the gods’ falling-out and reconciliation, and how this affected the world over millennia. No single human being’s perspective or experiences could possibly have encompassed that. Even with the three characters I used, I still had to elide a few thousand years to keep the story interesting and moving at a relatable pace. So, Yeine showed how the Gods’ War impacted the power brokers of the world; Oree showed how it impacted ordinary people and how the echoes of past violence tend to linger in the present; Sieh showed how it impacted the gods themselves. Meanwhile all three perspectives, which covered about 100 years in the human world, showed how events which seem like yesterday to gods cause massive upheavals in human society. 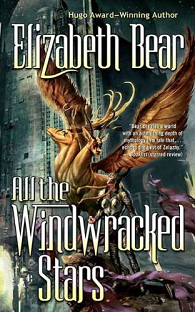 Aliette de Bodard took a different turn in her Dominion of the Fallen series. 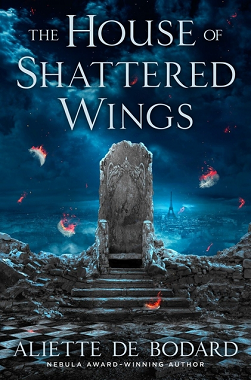 Set in an alternate turn of the century Paris devastated by a magical war, the first volume, The House of Shattered Wings, was focused on a particular House fighting a cold war of attrition and magical intrigues, and three characters within the House. 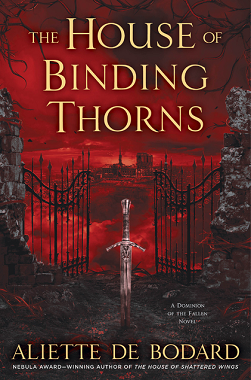 When it came time to write volume two, The House of Binding Thorns, I felt that some character arcs had been settled by volume one, and that to feature the exact same cast of characters would lead me to create new problems & new arcs for them. … So I gave some of them a break from being dragged strange places and repeatedly pummeled (only half a joke: I’m pretty rough on my characters) Finally, I wanted to shine the light on different areas of my setting—in particular, factions we hadn’t seen before—and this was much easier and natural to do by adding new characters. Changing the characters naturally changed the focus of the narration, which is what I was after—though there were a couple surprises. 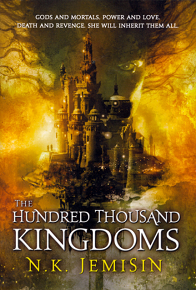 The first book was deliberately claustrophobic, confined to the one House—the new one changed locations within the space of a few chapters, which opened up vast areas of Paris we hadn’t seen before, like the Houseless areas, the suburbs, and the underwater kingdom under the Seine (dragons! I love dragons. Sorry). 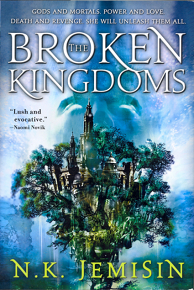 Not only the world changed, but so did the worldview: in the House of Shattered Wings there were no “powerless” characters: everyone had magical powers and no one really had to deal with going hungry. In book two, Françoise, who is Houseless, has a much harder time (even though she has a community to help out). And in fact, the theme shifted from a meditation on exile and loss to communities and how to belong, which is a different take on the idea of loss—it ended up a very different book. 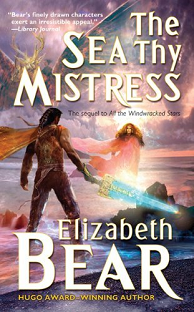 And in Elizabeth Bear’s Edda of Burdens Trilogy, Mingan, Muire and Cathoaire, Muire’s son, help keep the narrative focus fluid. So I didn’t really have any options; each of the three characters gets a book to play protagonist, and they’re supporting characters in the other protagonists’ stories. They’re stuck to one another by fate—by their wyrds, more or less—and their stories don’t really exist independent of their relationships. Writers choose to shift point of view in a series for a number of reasons, and the results are as varied as the writers themselves. Especially with first person point of view, readers become very familiar with a certain voice and a certain worldview early. The literary device of the “I” as narrator becomes a mask that we can look through, and adventure in, using the persona of that character. Shifting narrators between books means taking a risk — jarring a reader’s assumptions about the world, the story, and the characters themselves. In the case of Cloudbound, that was a really important thing to do, and worth the risk. Cloudbound is a story about leadership, and Nat is a very different character from Kirit. He’s more investigative, more determined to play by the rules — even when he doesn’t know the rules — and he’s had a very different life experience from Kirit’s. Allowing Nat to explore the city of living bone in his own way, and to see Kirit as she’d once seen him, also gave me the opportunity to reveal parts of the world and the story that Kirit might not have seen herself. I love that there are quite a few of us working within the tradition of shifting points of view. So, Ursula Le Guin, I’m sad I balked at first, and I’m so glad I learned to look for the expanded perspectives. More series with shifting narrative focus include Octavia Butler’s Parable series, Megan Whalen Turner’s Queen’s Thief series, Sarah Rees Brennan’s Demon’s Lexicon, Lois McMaster Bujold’s Vorkosigan Saga, Kristin Cashore’s Graceling series, Lois Lowry’s Giver, and Malinda Lo’s Ash and Huntress. 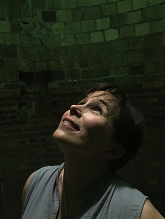 Fran Wilde is the author of the Andre Norton- and Compton Crook Award-winning, Nebula-nominated novel Updraft (Tor 2015), its sequels, Cloudbound (2016) and Horizon (2017), and the Nebula- and Hugo-nominated novelette The Jewel and Her Lapidary (Tor.com Publishing 2016). Her short stories appear in Asimov’s, Tor.com, Beneath Ceaseless Skies, Shimmer, Nature, and the 2017 Year’s Best Dark Fantasy and Horror. She writes for publications including The Washington Post, Tor.com, Clarkesworld, iO9.com, and GeekMom.com. 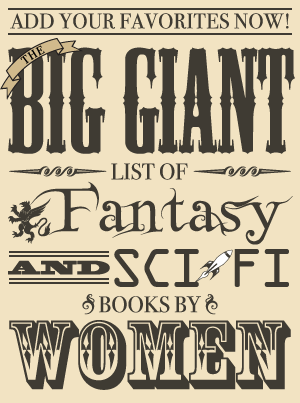 You can find her on twitter @fran_wilde, Facebook @franwildewrites and at franwilde.net.